Move individual beats while keeping the integrity of your music. To have the biggest impact on your audience, your music has to work perfectly with the visual. Sonicfire® Pro includes unique technology that will help you find music that matches the pace and timing of your visual sequences. However, if the music doesn't quite align with your on-screen events, the newly improved Timing Control feature allows you to easily move special musical beats without losing the rhythm or length of the music - accurately and with amazing results. Like all SmartSound features, no musical experience is required. As one of the most unique features available in the media creation industry, the beats that will consistently yield the best results have been identified as "Timing Control Beats". You can move these beats to snap to the nearest strong beat, so you always get amazing musical results. When you move a Timing Control Beat, the patented feature retains, as best as possible, the location (in time) of your music's ending as well as the integrity of the musical piece. Think about it: You're moving the beats of a real music track and yet the track itself is retaining its musical integrity and the location of your ending using SmartSound’s Custom Length feature - amazing! When working with music and picture, you will inevitably need to emphasize an event or transition in your movie with a distinct musical change. 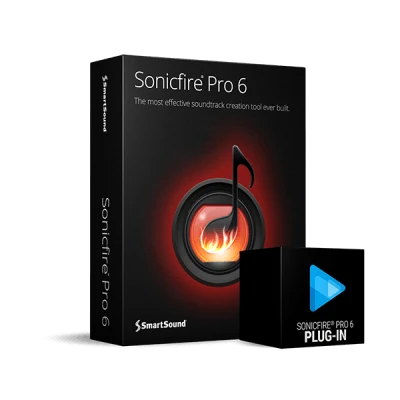 With Sonicfire® Pro 6's newly improved Timing Control capability, you can now grab a beat and move it to align with the events in your picture (it will go to the nearest strong beat to retain the music's integrity). If a song starts out slow and develops too quickly for your video, you can simply change the music sections to allow more time before the song develops into its full section. Use Timing Control to easily control the arrangement of the song to conform to the dynamic changes in your story.